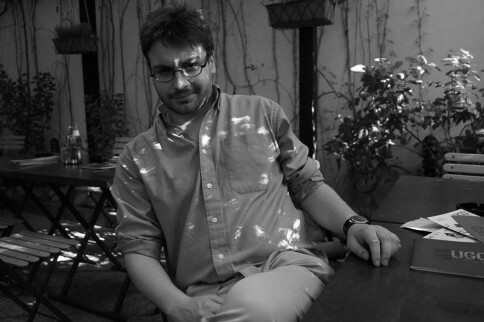 Peter Dentchev is a young and prominent Bulgarian fiction writer and theatre director whose novel “Just like a Man Kisses a Woman He Loves” won the first place at the contest for Best New Bulgarian Novels “Razvitie” in 2007. The next year the same novel won the special prize of “Raiffeizen Bank” at South Spring National contest. In 2008 with his short novel “Simple Story” he wins the second place at Ciela’s Novel Prize Competition. His latest novel, Silent Sun, was published in 2012. Everything began after you gave me that black pen. You then also gave me an ink-pot filled with black ink. I asked you why black ink exactly? And you answered that the blue one seemed too pleasant to you so you’d bought black ink. I smiled at your present because I knew it was probably related to my desire for writing. I often used to write on hand, can you remember that? You got used to me, to my talking in my sleep, to my vanity in front of the mirror; you were reading my stories without showing any reproach, and you used to make comments on them without superfluous flattering. I would sometimes read poetry to you – actually very rarely. You saw me falling in love with you and with another woman at the same time. Well, I have no reason not to love you, but I still argue that you didn’t love me. Actually you used to say that yourself. I had asked you several times to read to me some of your writings but you didn’t wish to. Once, I felt like I wanted to secretly open your notebook, where you had written at least few lines, however I never did that. Probably I will feel sorry for that in the future. One night, while I was filling my pen with ink, I steeped my finger in it. I did it on purpose, in order to feel whether the ink would be dense. I was wondering if that black liquid is cold, so I steeped my finger inside and it eagerly/thirstily soaked in. I quickly pulled my finger out and my nail remained uncolored – it was unable to retain the ink. But the ink stayed beneath the nail and inside the pores. I continued writing for another hour before I went to bed. In the morning I couldn’t wash the ink so I set off for work just like that – with a black forefinger. You often told me that you couldn’t stand me to wait for you in the evenings. I didn’t believe you – you were still happy to see me. In that same evening, the one after I had steeped my finger in the ink-pot, you came back home on time. My whole palm was already completely black. You used to say that you couldn’t always think only of me, but you enjoyed my presence around. You liked staring at me while I was shaving myself before the mirror. There was something very sexual in the way you were watching me removing the foam and the small hairs with the razor. I never cut myself. After that, I would always wash the razor and put it in its place, so that we could talk about your day. I was afraid we had nothing to talk about, that’s why I asked you the same question several times a night: How was your day? Sometimes I changed the phrase a bit: how did your day pass? I didn’t, of course, changed it a lot – just a tiny detail. I insisted on the time passed by, during which we haven’t been together. The rest of the day we would be together sleeping. You are talking in your sleep, too; did you know that? I wouldn’t wake up because of that, but sometimes when I stayed late up at night writing, I would hear you. Sometimes you were begging someone for something. Or you were asking questions and I would start answering. Then I would stop writing, light a cigarette (I was smoking only while you were asleep), and we would start a conversation in our sleep. The thought that you were living with me simply because you couldn’t afford to live alone, and that this was the only thing that kept you here with me, troubled me, because you had told me that yourself. I was wondering why you were trying to destroy me then. Or I have found my natural escape at the ink. I started wearing gloves all day long, and even in the evenings, but you never paid attention to them. You thought I was giving myself eccentricity and oddness, but I was just trying to hide my black palms. Later on, the dye raised to my elbows, it spread all over my shoulders and when it started raising to my neck, I began wearing the black polo – a present from my mother. I was wearing it, although it was a summer. The night when we were coming back from the theatre and I kissed you for the last time in the taxi, while it was stopped down at the street. Then you hold me in your thin, bony arms and I thought you’d never let me go. At that time, my chest was also black and I was scared you would hear my wheeze. This was the only time you had let me be so close to you and I was scared that when you put your head on my chest you’ll hear the whistling of air in it. When we went back home I vomited the whole dinner – it was liquid and black. I was taking a shower when I noticed that my groins were shapeless and I was never going to reach the dreamt moment of making love to you. I was probably never going to reach it because you had forbidden it in advance. Not that the ink didn’t matter. I had to soak it with cotton-wool because I was constantly sweating in black. I am writing now – for the last time. I am writing to tell you that this is the last time you are reading something from me. I was always afraid that you could read me as an open book, do you know that? But you were even more scared of that, so you’d never let me read your stuff, nor you’d let my body touch you more than the wheezy embrace in the taxi after the theatre. I once told you that your lips are raspberry colored. Forget about that – now when you wake up, there will be parched stains on your lips, greasy spots on your belly and you will be infected with this exhaustion of meaning – the black ink. I like the idea that I have penetrated into you without any violence – I have soused you lightly and tenderly, I have spread onto you like a soap bubble filled in with black ink. Maybe you will start loving me in a way, if you carry me in you, bеcause I know that you wouldn’t probably be befall by the same misfortune like me – you wouldn’t let yourself turn into an ordinary ink spot. That is how you used to call me – a spot. Actually you used another word – do you remember. You called me rotter. Of course, this hurt me a lot, but you pretended not to care. In the glorious between whiles of your dissatisfaction, when you would smile at me, I had the feeling that everything could be a lot more different. Now, however, it is completely impossible. You condemned me to become what you used to call me. A spot. I don’t believe I will dry up so easily, after I have bulged out like a huge bubble after I have penetrated after its burst. I suspect you won’t be happy waking up in the soaking wet sheets. Maybe you will wake up, feel the moisture and assume this is your own sweat. After that you will move around and you’ll realize that everything is soaked up with that liquid – the pillow, the sheets, and your hair. If I decide, I could simply turn into a small spot, similar to a mole over your upper lip. Or I could be a few moles – one beneath your left breast, another on the inner side of your hip; a third one on your belly and the forth one will be there indeed – over your upper lip. If I wish, I will spread all over you. I am not going to compromise you, of course – I will only show up at hidden parts of your body – your legs, your elbows. If I want to take revеnge on you, I will color your face, or your breasts. Sometimes I will cover your body with writing so that you can read my short message in the morning, just before the beginning of the day. Here you go; I am putting a full stop to this letter. And I start infusing myself into you.